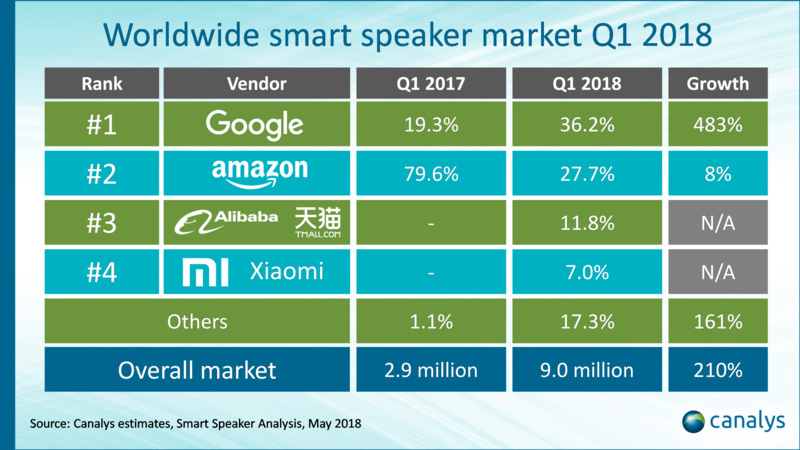 Smart speakers continue to be the world’s fastest-growing consumer technology segment, with year-on-year growth in Q1 2018 of 210% as shipments reached 9 million units. Google took the top spot, beating Amazon for the first time, shipping 3.2 million of its Google Home and Home Mini devices, against the 2.5 million Echo devices shipped by Amazon. The US market share fell below 50% for the first time, partly due to Google and Amazon’s focus on expanding beyond their home markets, but also because of the increased traction that the technology is seeing with new vendors in markets such as China and South Korea. 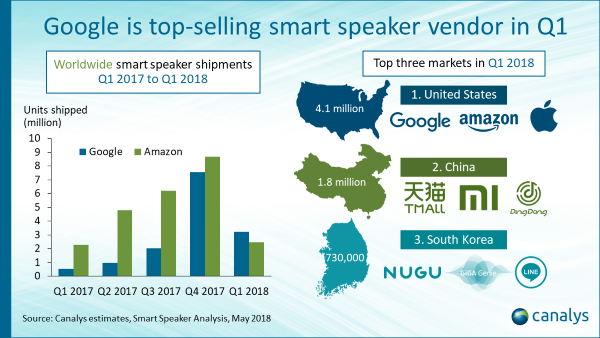 Vendors shipped 1.8 million smart speakers into the channel in Q1 2018 in China, while Korea overtook the UK to become the third largest market with 730,000 shipments. Smart speaker quarterly estimate and forecast data is taken from Canalys’ Smart Analysis service.